The other day I got to sneak away to one of Seattle’s year-round farmers markets for an hour with a friend. I hadn’t been to a farmers market for a while and apparently felt that I had to make up for lost time. I came home with some of my favorite hazelnuts, many pounds of potatoes, rutabagas and turnips, sweet crisp apples, a new supply of Nash’s field peas, and a big bag of Brussels sprouts. Big. I’ve had my eye on this salad for a while, and I’m happy to report that it did not disappoint. The version below is adapted from the Food 52 website, and I’ve updated the recipe title to reflect my own preference for the order in which the flavors should dominate. As always, one of the joys of cooking at home is that you get to tweak every dish to taste perfect to you. Go ahead, pile on the cheese or leave the onion out altogether. You’re the cook. Any Brussels Sprout Salad is going to start with Brussels sprouts, in this case about 1/2 lb., finely shredded. (I used the thin slicing blade of my food processor.) Thinly slice 1/4-1/2 of a small red onion and let it soak in cold water while you make the rest of the salad. In a small bowl, mix 2 Tbsp. lemon juice, 1 tsp. honey, 1 tsp. whole grain mustard, and a few grinds each of salt and pepper. Whisk to dissolve honey, then whisk in 1 Tbsp. olive oil and whisk again until the dressing emulsifies. Pile your Brussles sprouts and drained red onion into a salad bowl, toss with dressing, then add 2 oz. 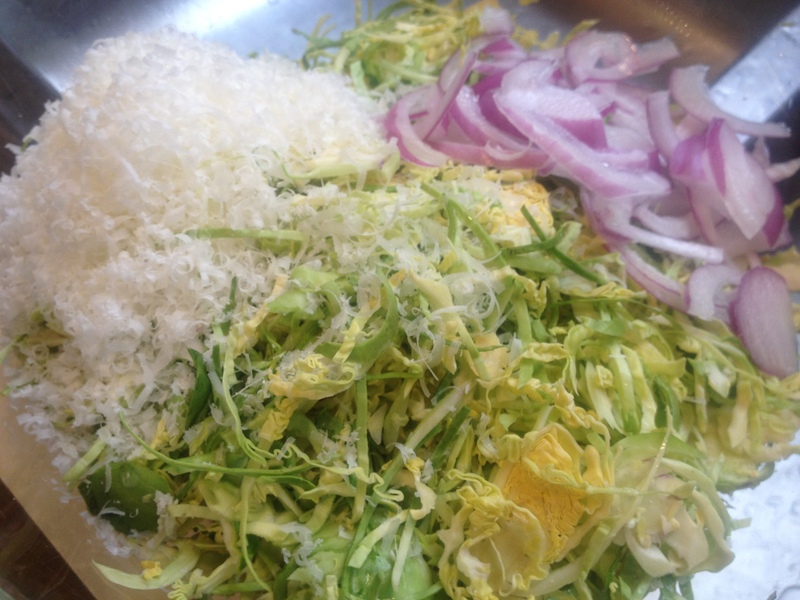 finely grated pecorino cheese and toss again. Taste and adjust (more lemon?) if that seems like a good idea. The original recipe says that this salad serves six, but I will get personal here and let you know that J and I polished the whole thing off by ourselves for lunch, alongside a wedge of Smoky Cauliflower Frittata. I told you we’d be making that again soon. This entry was posted in My Favorite Recipes, Salads, Vegetables By Themselves and tagged cooking, family, food, lifestyle, recipes, salad, vegetarian on February 12, 2012 by emmycooks. yum! brussel sprouts are one of my favorite vegetables, but you can only find them for a month or two in the market (is this a Florida thing? ), so we try and eat as many of them as we can. 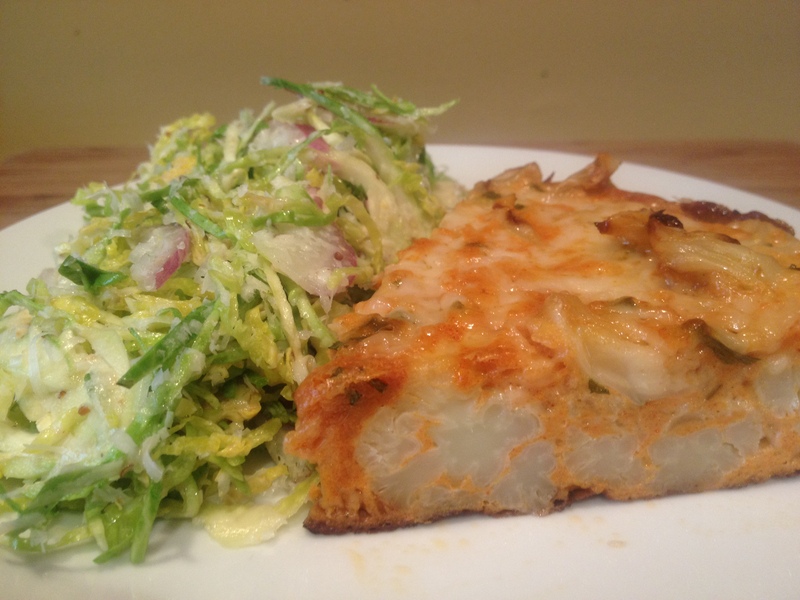 I’ve never tried a brussel sprout salad, but it’s on the to-eat list now! I love the idea of shaved brussels sprouts. I was toying with the idea of a creamed dish with shaved brussels sprouts, but never thought about using them raw in a salad. Now I have to try this! I am not a fan of brussel sprouts. The dislike is based on my experience with the veggie a long time back. But, my friend and I were talking the other day and she said that though initially she too was not big on brussel sprouts, she has actually grown to like it now. I really do want to be open to more veggies in my diet, and maybe this is the way to get brussel sprouts in my meals. Thanks for sharing the recipe! this is my favorite way to make brussels sprouts, especially because of the crispy brown salty parts! This looks delicious, what a great sounding recipe. It looks like a slaw so of course I am wondering what it would taste like on a sandwich. Or fish tacos? Would the flavor combo work? And that frittata looks fantastic. Let me know what you think! I hope you like it as much as I did. Farmers Markets ARE the bes t- even in Feb! i need to try this next time. sounds fantastic! the smoky cauliflower frittata sounds amazing as well. Wow this looks amazing! I love brussel sprouts! My go-to is always roasting. I need to try this out! So glad to find another person who appreciates the flavor possibilities of brussels sprouts.